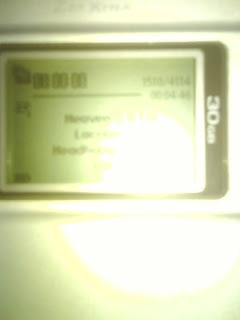 Woohoo.......my mp3 player is back on track. After a real screw-up with my Creative Zen Xtra, I'd lost all the songs on it. I had 4816 songs on em. But I'd gone home last weekend to meet my sister and good that Joel had a backup of most of the songs on his computer. Thanks dude. I owe you one!!. Cool, so my music collection is back!!. You can see a hazy number at the top corner of the screen on the player. Magic number 4114.